With such a large landmass, Brazil’s biomes vary widely, making it the most biodiverse country in the world. From the dense rain forests of the Amazon, to flooded wetlands of the Pantanal and the dry scrub and savannah grasslands of the Cerrado, the diversity of ecosystems found in Brazil means the country is home to many species found nowhere else on earth. 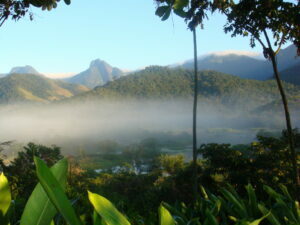 Protecting some of the last remnants of Atlantic Forest, Reserva Ecologica de Guapiacu (REGUA) is situated within the Serra dos Órgãos Mountain range only 80 kilometres north-east of Rio de Janeiro state.